A collection of rare live recordings! Dexter Gordon toured Europe in 1962, liking it so much that he soon moved there, living first in France and later in Denmark. After recording Our Man In Paris for Blue Note in 1963, he moved to Copenhagen. While he crossed the Atlantic from time to time, he performed regularly in Europe and enjoyed his European life before finally returning to the U.S. in 1976. This CD contains four live tracks recorded in three different locations. Gordon's original "Soy Califa" was recorded in 1967 in a high school in Denmark, which was recorded for a TV broadcast. Another original "The Rainbow People" was recorded in Holland in 1971 while the remaining two tracks were performed at Cafe Montmartre in Copenhagen in 1969. 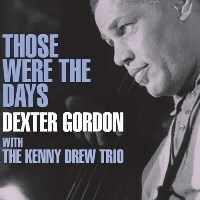 Pianist Kenny Drew and bassist Niels-Henning Orsted Pedersen accompany Gordon in all four tracks. Recorded August 5, 1967 in Denmark (Track 1); 1971 in Holland (Track 2); September 8, 1969 at Cafe Montmartre in Copenhagen, Denmark (Tracks 3 and 4). Mono.